Today, zero-carbon electricity comprises over 50% of Northeast electricity generation. About 25% is from renewable electricity, including large-scale hydro. To position the region to achieve 2030 targets, total zero-carbon generation must increase to 67% of supply, with the renewable electricity share rising to nearly 50%, outpacing both RGGI and targets set in state-level RPS (Figure 3). 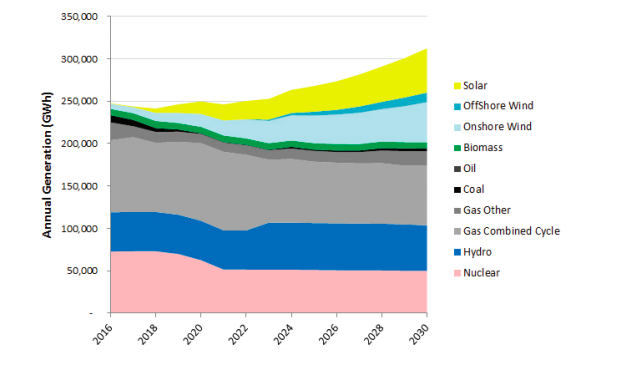 All major classes of renewable resources figure prominently in the Pathway: onshore and offshore wind, distributed and large-scale solar, and hydro power. What is RGGI? Established in 2009, the Regional Greenhouse Gas Initiative is an 11-state program to reduce Greenhouse Gas emissions in the electric sector. RGGI establishes a regional cap on CO2 emissions from power plants, which declines over time, and by issuing a limited number of tradable allowances. Tradable allowances provide market flexibility for states and emitting power plants to set their own compliance path. Proceeds from allowance auctions are returned to participating states, where they are invested according to state priorities, such as incentives for energy efficiency or electric vehicles.